Hello. The drift boat I picked up is on an old trailer. The distance from the axle forward to the cross member( bunk) is about 8" longer than from the axle back to the roller on the end of the trailer. When you look at the boat there is a lot of boat hanging off the back of the trailer. Can someone let me know the distances from the center of the axle to the front bunk , rear bunk and rear roller. I would be curious about the distance from the axle to the hitch on the tongue of trailer as well. The tongue on my trailer seems really short. Trailer is from the early 90's. Thanks. Most trailers have a post in front on which the winch is mounted. Is that welded in place or bolted, perhaps with big U-bolts around the hitch stem. I've moved those posts forward and back a bit, over the years, because of long boats now and short boats earlier. Or versa visa. Hi Sandy. That post is welded in place. I have been thinking about lengthening the back of the trailer because it is so short behind the axles. I was curious what the common space is between bunks and the amount of length behind the axles that controls tongue weight. 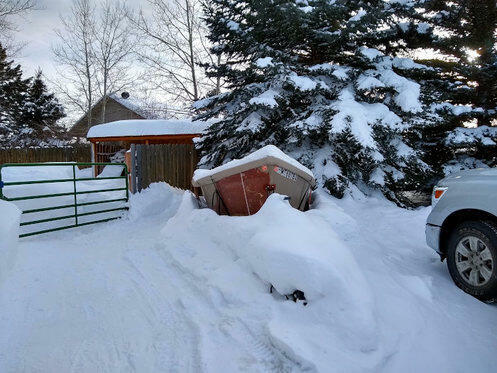 My trailer is buried in a huge snow bank right now. I'll measure it up at some point. Snow's melting fast. I'll measure my trailer up this weekend. Thank you Sandy. The snow is melting here now too. The last Nor'easter missed us. We had over 3 feet of snow in week from two different storms and then arctic air out of Canada hit us. This next week is going to be in the high 40's. All set. I just winged it. Shite. I forgot. Been busy. Boat building for a change. And dang. Of all things I have jury duty today. I'll still measure it up, as generic trailer dimensions. The boat I'm making now will have to be jacked up a few inches, it occurs to me now, so the new boat clears the wheel covers. 69" inches wide with lots of side flare. And my HD with 56" wide bottom barely clears the wheel covers now. I'm going to have to put 4x4s on the crossbars. Thanks for the video. I once saw a car pulling a small U-Haul trailer go out of control like the video. The trailer and car both ended up in the ditch and the trailer rolled and opened up like a sardine can. Dennis, who owns that company was very helpful to me in modifying a traditional deep vee trailer I got on the cheap for my drift boat. Sells all the components you'll need to modify as needed. I'll be finishing up a big white water boat with a 65" inch bottom this winter. My current trailer has less than 60" inches between the wheel covers. Do I need a new trailer? I think I'll put blocks on the existing frame bed, so the the bottom of the boat sits flush with the tops of the fenders. I will have to re-weld the rear roller a bit higher. I sold my torches and welding equipment. But it shouldn't cost much. I have a buddy who runs a welding shop. The distances on the trailer are really inconsequential. As long as you have enough tongue weight and the trailer is level to keep the camber correct on the wheels, there should be no trouble with towing. Stretch here, shrink there, doesn't matter as long as the tongue weight is enough. When loaded or unloaded a good rule of thumb is 2/3rds the weight should be ahead of the axel. If you are asking more about supporting the boat, that's another story. I try to keep the boat touching the roller, the front cross brace and the bow stop, while keeping tongue weighted appropriately. If you want the trailer to tow right the frame should be level then a 1" plus drop at the hitch. Loaded and ready to tow. Hitch down too much and you get excess tire wear and too high you get tire wear and a squirrely tow. To fast and it will swing around on the tow car.